The Brewers Association today released its second annual list of the 50 fastest growing small and independent1 craft brewing companies of 2018. Representing 27 states across the U.S., these small and independent breweries experienced a median growth of 163 percent with the median size being 1,350 barrels of in-house production in 2018. Breweries on the list range from 50 barrels to more than 40,000, and grew from less than 70,000 barrels collectively in 2017 to more than 170,000 barrels in 2018. 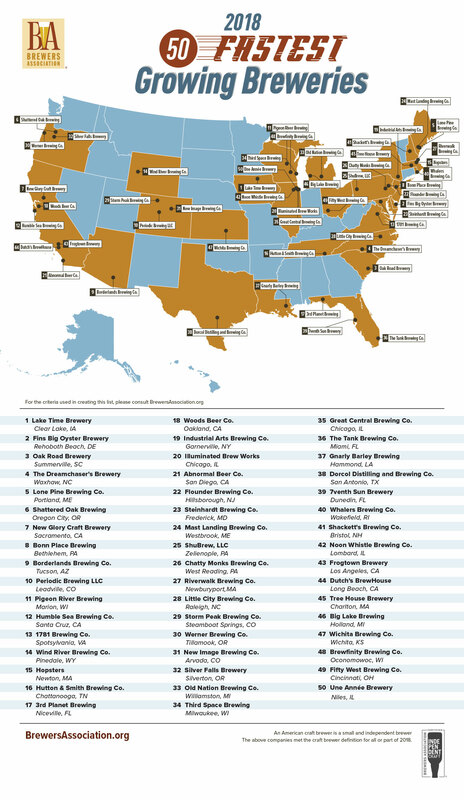 As a group, these brewing companies represent approximately 10 percent of total craft growth by volume for the year, and include 13 brewpubs, 35 microbreweries, and two regional craft breweries.